Against the backdrop of an aging society and a declining birthrate, Japan is placing hopes on service robots that are symbiotic with and supportive to their counterparts: human beings. However, the development of such robots faces many unresolved technical challenges. For Hitachi, these challenges are a driving force in research and development efforts aimed at creating a future in which people and robots will coexist in a partnership. Hitachi has been involved in the research and development of robotics since the earliest stages of industrial robot development. Recognizing the demand for service robots, Hitachi launched a development project based on the concept of a "human-symbiotic robot," called "EMIEW" (Excellent Mobility and Interactive Existence as Workmate) in 2004. Within a year, Hitachi succeeded in completing the first EMIEW with such functionality as agile mobility and the remote voice recognition and speech synthesis needed to "talk" with people. Focusing on the safety and practicality that a symbiotic co-existence with people would need, in 2007 Hitachi completed EMIEW2, featuring a compact, lightweight body and improved voice recognition capable of discerning human voices even in noisy environments—attributes that further its ability to work harmoniously with people. In 2016, Hitachi took aim at actual service applications, developing EMIEW3, which delivers stable on-site operation and a "remote brain" IT infrastructure especially for robots. Since September 2016, Hitachi has been carrying out demonstration testing at a number of locations, including Tokyo International Airport (Haneda Airport), train stations, and commercial establishments. Hitachi has set up facilities for collaborative creation with customers in Tokyo, Hitachinaka City in Ibaraki Prefecture. These facilities serve as centers where Hitachi researchers and customers can engage in development projects targeting the real-world service applications that employ EMIEW3 and robot IT infrastructure. Hitachi's Social Innovation is also expected to benefit from novel approaches coming out of its pursuit of service robotics through customer collaborative creation. There has been renewed and growing interest in robots in Japan where labor shortages are expected to become more severe. Use of robots has been popular, especially in manufacturing, since industrial robots were first introduced commercially in the 1970s. With growing concerns over aging society, service and other non-manufacturing industries are hoping to utilize robots to automate some service tasks and reduce human labor. Hitachi has been at the forefront of cutting-edge research and development in robotics since the earliest stages of industrial robots. Examples of Hitachi's achievements include robots with artificial intelligence and four-legged robots that can function in extreme conditions. Hitachi was early to recognize that there would be growing demand for service robots and launched a development project called EMIEW in 2004. The concept behind EMIEW is the "human symbiotic robot" that can coexist and support human activities. In order to realize this concept, EMIEW was designed to have agile mobility to be able to function well in human environments. EMIEW was also designed to be able to "talk" with people naturally using voice recognition and high-quality speech synthesis technology. Hitachi Group's research and development and technologies combined to complete the first EMIEW in just one year. EMIEW was then introduced during EXPO 2005 AICHI, JAPAN. Street performances with EMIEW and a human clown entertained and impressed many people. "EMIEW2" is 80 centimeters tall (about 2.6 feet) and weighs 14 kilograms (about 31 pounds). It is lighter and more compact than the original EMIEW. Hitachi then began developing EMIEW2, focusing on safety and practicality. 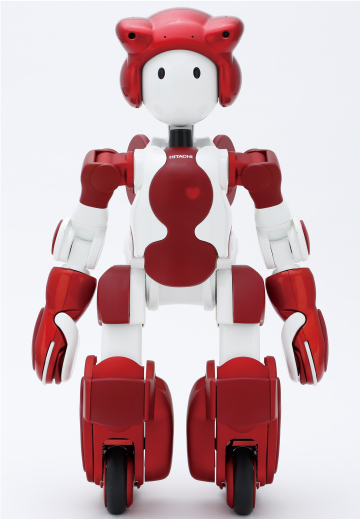 Hitachi revised the development process for EMIEW2 to make the robot work more harmoniously with people. First, Hitachi determined its size, weight and moving speed from practical considerations, making EMIEW2 lighter and more compact. The voice recognition system was enhanced to be able to recognize human voices even with background noise. Mobility was improved to be able to detect and respond to relatively small differences in heights on uneven floor surfaces while walking. EMIEW2 was completed in 2007, designed primarily to perform services as a guide in offices and public spaces. Cutting-edge technologies incorporated in EMIEW2 include "object search" technology to recognize and locate objects, allowing it to search through a database of images collected from network cameras and the internet. Another example is the achievement of advanced intelligence-processing capabilities while keeping the robot body compact. This was accomplished by adopting a concept known as "Remote Brain Control." This concept divides robot functions into two categories: real-time processing for such operations as travel control and obstacle avoidance, and remote-information processing for high-load processing tasks, such as recognition and analysis. Cutting-edge technologies nurtured in research and development for EMIEW2 have paved the way for next-generation projects that focus on autonomous moving technology. One outcome is the commercialization of the "Lapi" robot, a logistics-support robot that can move autonomously due to the application of intelligence and maneuvering technologies. Another project is the development of "ROPITS," a vehicle-type, autonomously mobile robot that can transport people safely from a designated place to their destination. It is hoped that these types of robots can provide mobility for the elderly in Japan's aging society and others needing such assistance by providing safe and comfortable short-distance transportation. Setting its sights on robot utilization in the real world, in 2016 Hitachi made an evolutionary leap forward over EMIEW2 by developing EMIEW3—a model with stable on-site operational capabilities—and robot IT infrastructure. Since September of the same year, Hitachi has been carrying out demonstration testing of EMIEW3 at a number of locations, including Haneda Airport, train stations, and commercial establishments. EMIEW3 has a height of 90 cm and weighs 15 kg, and can travel at 6 km/h while negotiating bumps as high as 15 mm. It can also right itself if it falls over to avoid incurring any inconvenience, while performing actual service duties. EMIEW3 is configured with a remote brain, located separately from the robot itself, and which performs intelligence processing, handled by robot IT infrastructure configured in the cloud. This design makes it possible to improve the performance of intelligence processing while keeping the body compact, and also allows for functional expansion by linking it with external systems. Moreover, as the monitoring and control of the operation of multiple robots with multiple bases can be performed together, the robots are able to share information among themselves and pass on their services to others. One place where demonstration testing was carried out was at Haneda Airport. Here, robots gave directions to restrooms and other places and supplied information about shops on the premises. During the test, robots successfully picked out user voices even through the considerable noise of the airport and its numerous high-volume announcements. Users were also able to interact naturally and without confusion with EMIEW3 when it spoke to them. These and other results showed definitively that the robots are capable of taking on actual service situations. The test also revealed issues needing improvement, such as in actual communication and the speed of autonomous travel by the robot when it guides a user somewhere. See a video of EMIEW3. Despite an interest in service robots, many companies never get to the point of actual implementation due to a lack of clarity about specific ways to use them and advantages gained from their use. To encourage such companies, Hitachi has set up facilities specifically for collaborative creation with customers in such places as Tokyo, Hitachinaka City in Ibaraki Prefecture. Equipped with operational verification labs, these facilities let Hitachi researchers and customers team up to pursue the development of service robotics that employ actual EMIEW3s and the robot IT infrastructure. These centers are also host to a process in which researchers share issues with customers and test ideas for resolution through on-site demonstration testing. The results of these tests are then applied to actual operational improvements. Hitachi is committed to engaging in new research and development for robotics as a means to create social innovation that yields solutions to social issues. Solutions By: Research & Development Group, Hitachi, Ltd.